I hadn't quilted for a while as found fabrics were getting expensive for me.Now my local charity shop is going to save me small bits of material they cant use so I can make quilts .Also I have the option of giving them ones I make to resell.Good both ways for me giving me an outlet and free fabrics. What a great idea! Congratulations to you in making the connection to the shop. Be sure to post pics. This is a very visual group! Talk about recycling. Quilters have been doing that for years. Great that you're doing this to help raise funds. also, i had asked my local 'goodwill' shop for any stained or torn mattress pads to use as batting. i made them a quilt to sell with it. The average price of new fabric here in UK is 20 dollars a metre (39") so I am always looking in charity stops. Good luck! maker of the 'Oh Dear Jane' Quilt, or should I say trying to the the maker of it? Yes, charity shops (or thrift shops) are very often a good source of material. Have a look at Bonnie Hunter's www.quiltville.blogspot.com site. She makes a lot of her scrap quilts from recycled cotton shirt fabrics. She even has a video on how to de-bone a shirt. I am doing a little destashing and not wanting to bother with sale. I could "pay it forward" if you are interested. I will cover shipping, too. If interested, pm me your address!!! They said yes. I returned two days later and had a large trash bag of jeans from one and also one from another. I didn't ask them for a 'nonending' deal, but rather, just a few days...and got plenty of jeans...enough to get me started. How very sweet of you. I am so proud of our QB members. We seem to have such generous hearts. I have been destashing also. GOD Bless you. I am 50 yrs old and I have and will continue to use what material I can find new or used like skirts shirts or aprons or what ever.My mother and grandmother did and I always will as long as I am able to.Don't waste nothing these days or you will probably regret it. I know what you all mean--I have a hard time getting rid of clothes that don't fit because it's got some nice fabric in it!! Oh my gosh! I had no idea how much you guys paid for quality fabric. Keep looking for charity shops...I would be. Here in Canada it's pretty similar. The prices seem to range from about $17 - $25/m (39") for quality, or even for poor quality in some cases. I ran into a lady in Walmart the other day. My cousin, her daughter, and I were there looking for baby stuff, and of course had to snoop at the sewing department (ours don't have bolts of fabric anymore, so it was mostly just looking at pretty colors) and we were discussing Fabricland (our version of Joann's) and a lady overheard us and said where should I shop then if FL is poor quality and expensive? We all spoke up and said the quilt shops! Here, they're actually cheaper as a rule than the fabric shops, and better quality. The worst part of it is, because the fabric shops are what a lot of people know about, a lot of people new to sewing think that sewing is more expensive than it needs to be. I really want to order online, but I can't get past not being able to see and touch the fabric first. Besides, I really don't need more at this point. My stash is more like a museum than something I use lately. That's a fantastic idea and it's nice to have that special relationship with the charity shop - works for both of you. alikat110, what a nice thing to do for her. Hip Hip Hurray for the quilting board sisters. I've made about a dozen personal sized rag quilts this year. Only one had fabric specially purchased for it. 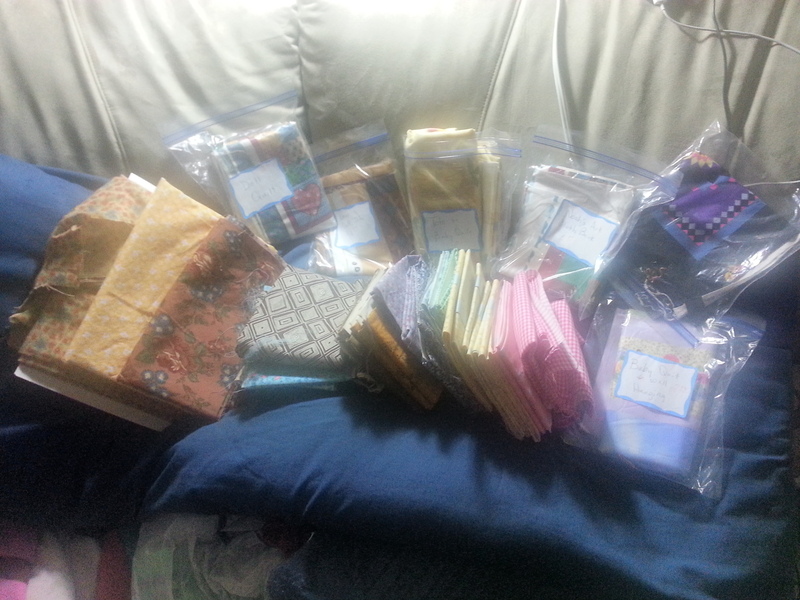 A couple years ago, a gal at church got a boat load of sewing and quilting stuff for a $7 bid at an auction, which she passed along to some of us who sew a lot. Among the things she had was a pillow ticking day bed cover. And some red denim whatever that was probably used as curtains. She and the other ladies wanted to ditch the fabric because of some stains. NOT ME. I grabbed it, dumped it in a big bath of Oxy-clean, then hit it with the seam ripper. I got a lot of fabric out of it. Early this year, her hubby was diagonsed with cancer, late stage. I made him a rag quilt out of the ticking and the denim. Added a bit more fabric and he ended up with a neat quilt. It was almost like B bought the fabric and I did the work. This is so nice of you. I have already claimed some of my husband's shirts when he no longer wants them, they are lovely fabric and nice looking. I love finding material and notions at yard sales and thrift stores. We have a few in town that I have a lot of luck with. One sells the fabric $1.00 a meter! THEN we go to a yard sale of a sewer and she was selling so many nice pieces of fabric . I only spent $5 but I wanted it all!!!! I don't yard sale much. I get in enough trouble at Goodwill. Did pack away some plaid men's shirts, pants and skirts from our church rummage sale. Didn't cost anything, as it was being packed up for its next home. I'm wanting to get a couple church projects going. Pillow cases for Special Olympicians and shopping bags for some living in group homes.